Whether stranded in the woods or taking care of yard work, there is one brand that can be trusted above the rest and that is Gerber. The new Apocalypse Gator Machete embodies the dependable quality that has made Gerber the nation's top producer of high-end knives and multi-tools. 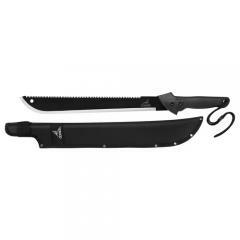 A whopping 18-inch, high-carbon steel blade delivers the strength and durability needed to hack through grass, vines and brush and still maintain its razor-sharp edge. When large branches or trees get in the way, flip the Gator over and use the serrated saw to get the job done. A rubberized handle delivers a secure grip with sweaty hands, or in wet conditions, while the flared hand guard protects operators from accidental injury. Make sure this one-of-a-kind tool is never left behind using the convenient riveted nylon sheath.